You’ve heard about them, but have you seen one? And yes, they do exist and can be found at Calgary’s custom mattress designer and builder, Sleep Boutique. Some people like and want more space while sleeping with their significant other — the sound effects from the other side of the bed may be too loud, or too much motion. The Family Bed. Many families, especially younger ones, want the whole family to sleep together. Big Dog people. If you have no space in your bed because of Mans’ Best Friend, it could be time for the Alaskan. Other folks have the room and want the biggest, baddest bed on the block. An Alaskan King Bed, like its namesake, is enormous at 9 feet x 9 feet. We also can make an Alberta King Bed which measures 8 feet x 8 feet. The next biggest size is theWyoming King Bed which comes in at a mere 7 feet x 7 feet. Then there are the more traditionally sized California King and Eastern King beds, which seem, well, kind of small. How can you fit it in my house? Many homes can accommodate an Alaskan. Obviously, you need a large enough bedroom, but you also need the space to get a mattress this size into your house. At Sleep Boutique, we have created a modular mattress design we can get it into any house. A modular mattress will have multiple components inside one cover. A good example of this is Sleep Boutique’s Orchid Mattress. As for a foundation/boxspring, most custom mattress builders should have some options for you, or you can always have a custom Platform Bed Frame made. Where can I find oversize bed linens? The other considerations are sheets and duvets, which you won’t be able to find at big box stores either. 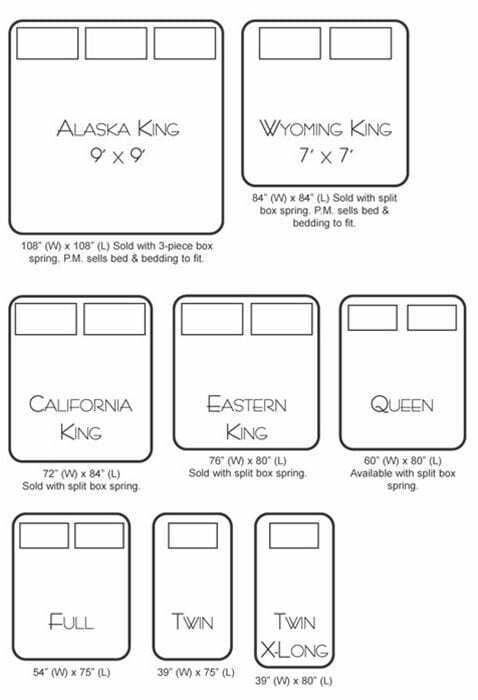 You can, however, easily find retailers online — here’s one example — Alaskan King Bed Linens. Have a mattress protectors, fitted sheets, flat sheets, duvet covers and comforters from one location delivered right to your home. Big box mattress stores aren’t going to be offering these. Our customers come to us because they don’t want to deal with a traditional retailer — they want to know what’s going into their mattresses and they want to pick and choose from different options. You can find custom mattress builders locally or online. You can also try some Foam Shops or upholstery shops as well. As for costs on mattresses of these sizes, it is obviously going to vary depending on manufacturer, size, materials and components used in the mattress along with the outside covers. The great thing with custom mattress builders is you can get a higher quality (better ingredients) mattress for less than you think. Custom doesn’t necessarily mean more expensive. Come see an Alaskan King Bed live at Sleep Boutique’s booth at the Calgary Home & Garden Show March 1-4, 2018. Unlike traditional mattress retailers, Sleep Boutique doesn’t have an inventory of pre-built mattresses in its store. Once the right kind of mattress and ingredients are decided upon, the mattress is then built on site in the Sleep Boutique workshop. If you need further information on oversized King Mattresses, please contact us at info@sleepboutique.ca or call us @ 833.244.6288, or even better, visit us at our showroom at 5010 1 St SE, Calgary, AB T2G 2L3 on Tuesday – Friday 10 a.m. – 5:30 p.m. and Saturday 10 a.m. – 5:00 p.m.